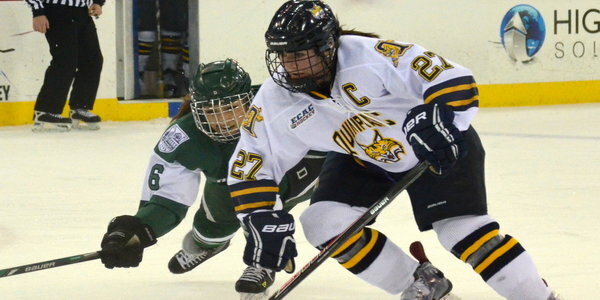 The Quinnipiac women’s ice hockey team rallied late to defeat Dartmouth 3-1 Friday night at the TD Bank Sports Center. A goal by Morgan Fritz-Ward proved to be the game-winner. Olivia Brackett fired a shot at Dartmouth goalie Lindsay Holdcroft, which deflected off her pads and right to the stick of Fritz-Ward who sealed the deal. Before the eventual game winner, Kelly Babstock added to her points total by crossing the puck across to Emma Woods on the right side, who placed her shot just inside the post, to tie the game with 43 seconds left in the period. It was good for Babstock’s 23rd assist and Woods’ ninth goal on the season. The final goal came from Nicole Connery with 2:17 left in the third period, when Meghan Turner found her open on the opposite side. The only Dartmouth goal came with just over eight minutes left in the second half. Emma Korbs, with the puck at the blue line, fired a slap shot. Laden went low as the puck sailed high right. For the first time this season, Brackett had the alternate captain mark on her, a reward for her leadership and consistent playing time, Seeley pointed out. Tomorrow the Bobcats take on No. 5 Harvard at 4:00 in the afternoon. They hold the top spot in the conference. Quinnipiac knows it will be a tough matchup, but the emphasis was on defeating Dartmouth.